Former Hearst chief Anna Jones is focusing her efforts on empowering female entrepreneurs. Anna Jones has always had an entrepreneurial bent. But when she resigned from one of the most plum jobs in glossy magazine publishing – chief executive of Hearst UK – to co-found a start-up, it still came as a surprise. At Jones’ leaving do last month, Hearst president David Carey, who flew in from New York, joked about how the two of them had discussed how to foster an entrepreneurial spirit inside the company. Little did he realise that Jones was going to leave Hearst to set up on her own. Jones quit the high-profile job last October after less than three years to set up AllBright, a funding platform and academy for female-led businesses, with friend and entrepreneur Debbie Wosskow. When Campaign interviews Jones on International Women’s Day, she sports a white T-shirt emblazoned with the legend "girl power" in bright orange. "I’ve always been interested in women in business and feminism," she says. When Jones was running Hearst, she says she "thought quite carefully about how we should position ourselves, reaching one in three women in Britain, empowering women and thinking about that platform and what it could do". You’re never done, don’t get me wrong, but I sort of felt it was time to move on. And as she became more involved in helping women in business, Jones found herself standing on an increasing number of stages and talking about the same issues over and over again. Despite the discussions, she felt no-one was "actually making a positive change and doing something about it". She cites research showing that one in ten women wants to start her own business and female-run companies deliver a better return on investment (35% on average) yet just 10% of capital is invested in female-run businesses. To tackle this issue, she and Wosskow, who calls Jones a "northern grafter", came up with the idea for AllBright by "scribbling it out on napkins in restaurants". "I just got the bug," she says. Jones explains that AllBright is not just about providing access to capital but "democratising access to cash, making [the process] easier, thinking about how you can support women" and attracting more female investors. AllBright is an ecosystem that helps women build their enterprises by putting them in touch with business angels, who can invest from as little as £1,000 as well as offer their expertise. There is also an opportunity to invest sums beginning at £100 as part of a crowdfunding scheme. The start-up boasts some impressive backers. These include Lord Davies, the former banker and ex-Chime Communications chairman, who has helped the government increase the number of women on boards; Tammy Einav, the joint UK chief executive of Adam & Eve/DDB; Lord Chadlington, who ran PR companies Shandwick and Huntsworth; and Alexandra Chong, the founder and former chief executive of Lulu, a social app for women that focuses on relationships and dating intelligence. 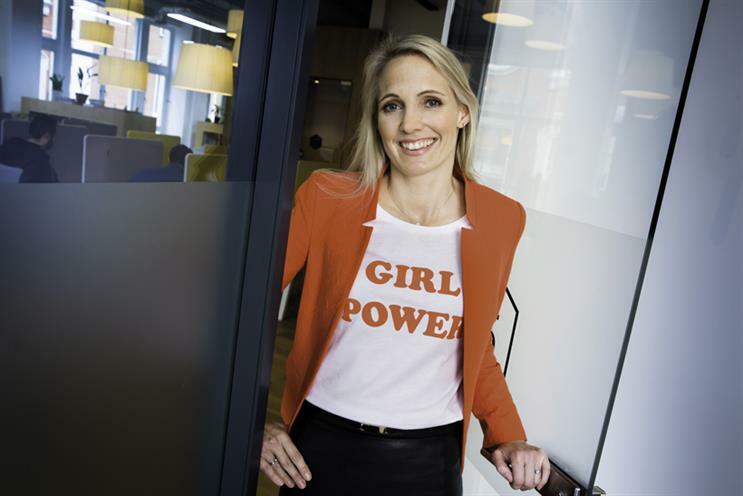 Jones says: "We feel that this is the moment in time when people are recognising that if female founders are an untapped asset class, then that offers a huge opportunity to make a difference to UK plc and also to make a positive impact for investors." It is about driving real economic change and not just doing things "tokenistically", she adds. It is a big task and one that needs Jones’ full attention, which is why she left Hearst to "run away with the circus," she says, quoting Wosskow. "People started saying, ‘We’re in, we’ll invest, we’ll give you some time, you need to be in this.’ It was kind of ‘You can’t just do this on the side to really make a difference'," she explains. The big step into entrepreneurship does not mean Jones thinks publishing lacks such spirit, only that it’s "very, very difficult" to apply those principles in practice. She says: "The truth is, when you’re in a corporate structure you cannot move as fast because there’s a lot of governance – which is really important – but it’s like turning a tanker. The attraction of starting as an entrepreneur is you can move very quickly. Everyone who knows me knows I am a very impatient person." Jones, who rose through the ranks at Emap and Hachette Filipacchi, says she feels lucky to have had the opportunity to lead Hearst and fulfil her mission to "diversify media brands and create a modern media company". This included turning around the fortunes of one of its flagship brands, Cosmopolitan, by developing a new distribution strategy involving running more events and giving away almost 100,000 free copies. Hearst UK posted a £5.4m pre-tax loss in its recent accounts. "You’re never done, don’t get me wrong, but I sort of felt it was time to move on," Jones adds. "I’d done what I wanted to do in terms of making people see that company in a whole different way and grasp the opportunities in a print-based business in terms of what you can do with those magazine brands." Industry observers credit her with doing a decent job in tough circumstances by holding profits steady in the core media business, even though Hearst UK posted a £5.4m pre-tax loss in its recent accounts. Print advertising revenue has tumbled across the sector but Jones does not blame media agencies for seeking bigger margins outside publishing. She says, "It is always really quite complicated and everybody is under the pressure of being part of a holding company. Every chief executive has a margin to deliver, you have clients moving for no fees, how are they going to make money? They’re a business. "I don’t think the blame lies anywhere particularly. It’s a complex web." As magazines continue to compete with free websites for eyeballs, Jones wonders whether readers in 20 years’ time will decide they want to pay for high-quality editorial. She says, "I think this younger generation is a bit more focused on such things as the provenance of their food and the mission behind corporations, so maybe people will start thinking about content. It would be quite a good future to imagine." As far as Jones’ future is concerned, there is a lot more she wants to do with AllBright. There are plans to open bases in Manchester and London for the start-ups, find some commercial partners for the academy and set up online content to provide founders "with inspiration and information". Jones’ plans for the future are inspiring but it is hard to feel as confident about the future of the industry on which she has turned her back. Favourite media: All of it!